Our Leadership Meet the members of our leadership team. Corporate Responsibility As a responsible corporate citizen our belief is that financial performance and responsibility for our environment, our employees and the global communities we touch are inextricably linked. LNG Equipment & Systems Chart is the world’s leading single-source LNG equipment and solutions provider across the complete value chain – liquefaction, distribution, storage and end-use. Brazed Aluminum Heat Exchangers Chart’s Heat Exchangers and Cold Boxes are at the heart of low temperature natural gas, air separation and petrochemical processes worldwide. Products For Industry Chart designed and built products are fundamental to the cryogenic and non-cryogenic separation, storage and delivery of atmospheric gases; nitrogen, oxygen and argon and CO2. Applications Served Chart Industries provides gas equipment for many applications around the world. Aluminum Dewars MVE Chart offers the widest range of compact aluminum storage tanks available on the market today. Stainless Steel Cryogenic Freezers Chart Industries offers a complete line of MVE stainless steel cryogenic freezers. Find out where you can find us. Chart Engineered Systems are manufactured to ISO 9001:2008, certifying quality of the highest standards. Our experience, lean manufacturing practices and project management oversight assures that your system will be delivered on schedule. Our custom, application-focused System Solutions are available for Nitrogen, Argon, Ethylene, CO2, Oxygen, LNG, Hydrogen, Helium and Nitrous Oxide applications. Our experience, lean manufacturing practices and project management oversight assures that your system will be delivered on schedule. 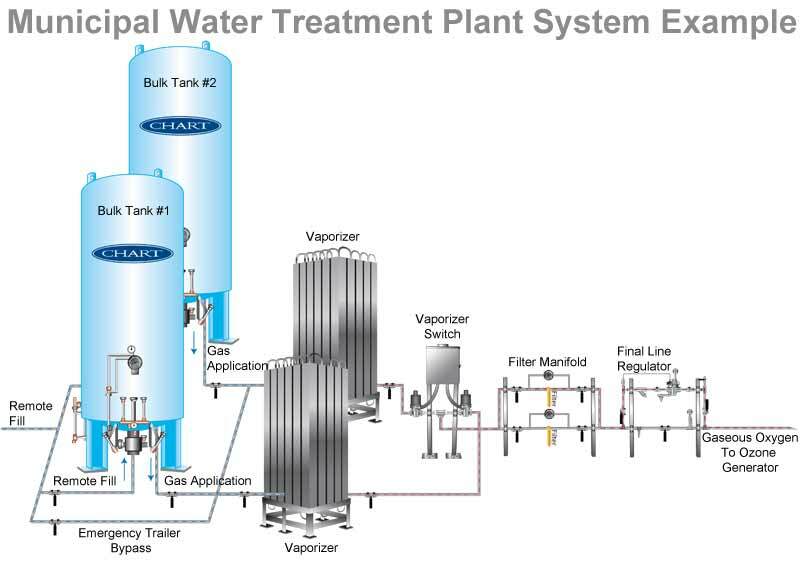 Nitrogen Applications for Inerting, Aerospace, Liquid Nitrogen Purge Systems for LNG, Food Freezing, Cryobiological Storage, and many other applications. Argon Applications for Purging, Inerting, Steel & Metals Manufacturing, Welding and Laser Applications. Ethylene Applications for Refrigeration Loop Cycle, Polypropylene Manufacturing and Ripening Fruit. Oxygen Applications for use in Healthcare, Mobile Hosptials, Water & Wastewater Treatment Plants (Ozone), Chemical Formulation, Fish Farms, etc. LNG Applications for use in Heating & Boiler Systems, Pipeline Back-up, Transportation, Fueling Stations, Regasification, Power Generation Distribution and Oil & Gas Exploration. The mobile hospital trailer is designed to provide an uninterrupted supply of liquid oxygen (LOX) to a hospital. The trailer is ideal for hospitals that are switching over to a new LOX system due to construction, change of gas supplier, or maintenance of current LOX equipment. The system is comprised of a primary horizontal 3,000 gallon bulk tank, reserve horizontal 900 gallon bulk tank, 3 circuit ambient vaporizer, pressure control manifold, as well as full LED lighting. For a sample of our capabilities, check out our extensive collection of case studies in the literature section below or view our US catalog or our Europe catalog. To inquire about your application, contact Chart Engineered Systems direct at 888-877-3093 in the United States or +420-412-507-111 in the Czech Republic. View example of an engineered system.